To the left of the starting point and round the corner you'll find Hunter. Simply glide after him a couple of times and he'll give you this dragonfly. Found wandering around to the right of the starting point. In the area beyond the Ice Gate near the entrance to Jurassic Jungle. In the middle of the open area beyond the Lightning Breath Gate. Flame the eight scarecrows for the Flame Challenge Portal found up near where you finish Hunter's gliding lesson. Complete the Ice Challenge Portal located in the area beyond the Ice Gate. Complete the Lightning Breath Challange Portal. Running around down on the shoreline past the Lightning Breath Gate. Beneath the pavillion next to the entrance to Monkey Monastery. Loose in the area beyond the Ice Gate and near to the Ice Challenge Portal. Free all five of the Dragon Senseis. Directly ahead from where you start. In the righthand side of the second open area. Wandering the corridor right after Moneybags' bridge. Rescue all three baby dragons' kites. Roaming on the same platform as the second young dragon with a kite, RJ. Running around on the slope beneath the final Dragon Master. Complete the Time Trial in the Banzai Speedway. Complete the Tank Training Arena mini-game. At the first bridge drop down into the area below it, the dragonfly should be on the right. Running around just past Farmer Dean. At the bridge with the portal to Platform Panic climb the ladder on the side. Once you've freed the cows go to Farmer Dean and herd his five cows. Once you've freed the cows four cannons will appear throughout the level. Use Electric Breath on each of these in order to destroy the large UFO. Get to the end of the level and detonate the TNT. Complete the Super Flame Challenge Portal near the barn with the portal to the Cow Abduction mini-game. Complete the first round of the Cow Abduction mini-game. Complete the second round of the Cow Abduction mini-game with gold UFOs. Get to the centre of the platforms in the Platform Panic mini-game. Just along from the final pig, Chili. Climb several ladders and then glide to the platform in the middle of the third open area. Free all of the pigs in Luau Island. Head Bash a button above the prison in the second area. Use a cannon on a boat to smash a pile of rocks and open up a cave. Use a superflame powerup gate to smash some statues and get some platforms to rise and reach Homer high up. On the beach directly ahead from where you start the level. Beat Hunter at collecting baby Mantarays. Beat the first round of the memory game. Beat the second round of the memory game. Inside the Clock Tower in the area with all the gears. Running about near the entrance to the corridor that leads to the Thunder Cloud pool. Take care of some Storm Clouds hovering above a pool. Reactivate all four machines in the level. Just outside the entrance to the gear area of the Clock Tower. Running around in the rainbow area, up high on the platforms and along the rainbow. Sitting happily on a pillar in the first open area after the rainbow. Complete the Time Trial of Rainbow Speedway. Beat the Bed Planes in a race in Rainbow Speedway. Save Puffy Palace from attack by four large flying ships. Close to the start of the level, directly ahead as you glide down. Free all of the yetis from their ice prisons. On the ledge above Bartholomew's house. The key is located near the entrance to the Turret Factories and the chest near the start of the level. Shoot three flying riptocs down. Up to the left in the area beyond the large doors at the start of the level. Behind the doors near the start of the level, you'll need to have been through the whole level before they open. Slide down the Ice Slide before running out of time. Slide down the Ice Slide again before running out of time. Destroy all twenty Turret Factories for Mandy. On top of a tree in the area with the portal to Sticky Swamp Shootout. The key is found a flower along the same platforms as Russell. The chest is on some platforms further along near the end. Spit rocks to destroy some beehives for Alex-Bob. Turn off all of the Honey Stills in the level. Chase down and kill a thief. Hiding behind a tree near the portal to the Sticky Swamp Shootout. On a tree just before the locked chest. Get to the bottom of the Honey Slide. Complete the Sticky Swamp Shootout. Kill all of the Wizard Riptocs with their own spells. The key is on the slope in the Pool Cleaner room, the chest on a ledge to the left of the start of the level. Put out all of the fires for the Ice Challenge Portal near the end of the level. Jumping about on a high up platform in the area with the final Wizard Riptoc. Perched in a lantern in the area with the cracked wall. Flying about along platforms with several swinging axes, the portal to Oasis Speedway is nearby. Over the edge and down to the right after the final Wizard Riptoc. Complete the Time Trial in Oasis Speedway. Beat the thieves in a race through Oasis Speedway. Kill the Wizard Riptoc in the centre of the platform puzzle. Kill seven R-1000s on the lava for Dr Kogan and pick up the beakers they drop. Flame the Gem Statues in the correct order; Red, Green, Blue, Purple, Yellow. Complete the Lightning Challenge Portal near to the Volcano Slide portal. The key is found on top of the yellow Gem Statue and the chest to the right of the first entrance in the level. Chase down a thief running about on some lava. Kill all of the Cavemen Riptocs in the level. Up on the platform going around the edge of the room with the Gem Statues. Running about on the lava with the R-1000s, use the invulnerability gadget to reach him. Get to the bottom of the volcano slide safely. Get to the top of the Tower of Scary and Ridiculous Heights. OMG BEST DAY EVER! I just head bashed through the ice gate! I liked the graphics, its just my game was messig up after the first 2 days to i sent it back. Also, it was AWEFUL and hard. Yay! I've got now any dragonflies! Thanks dark52! how do you know this information, "yearofthe"? Ohhhhhh, Anonymous, You purple putz! this game is RETARDED!! 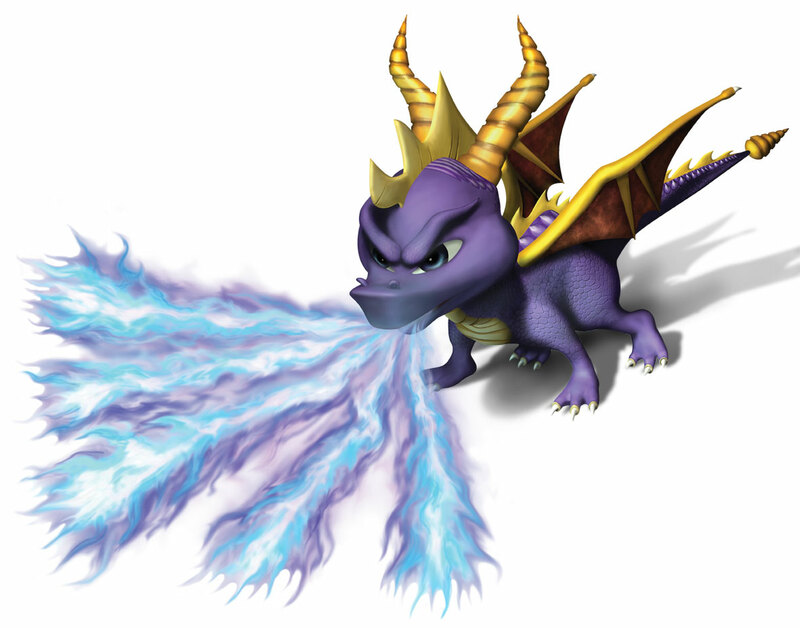 it is a huge embarresment to the spyro series! throw this retarded game out! soooooooooo sorry dark52 for saying retard!